You must be wondering that we bloggers are technically obsessed with spending our bucks and grabbing each day one or two products to revamp our vanity. Well, that’s definitely not the case. With this Body Polish here, I legit fell for it twice and yet didn’t buy it. I pretty much get attracted to every next product but I only buy it once I weave a need for it within my mind. Sounds familiar, anyone? 😜 Some time back, I had used SkinYoga’s Coffee Scrub & since then, I’ve been looking out for another. To be honest, that one was simply out of my budget and only because I received it within my Fab Bag that I could give it a try. Since then, I’ve used many but none worked to soothe my super dry and flaky hands. As much as my face is oily, my hands on the other hand are really dry. 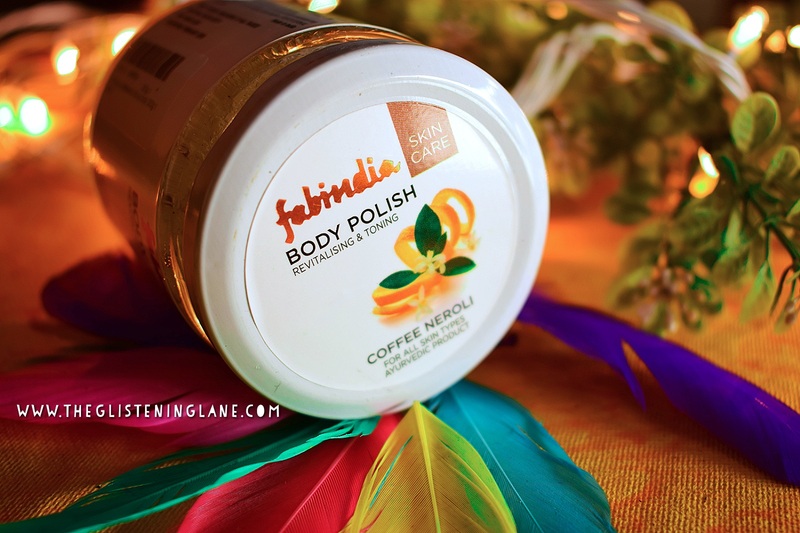 Description: Made with sugar, sea salt & coffee bean extract, this luxurious polish gently exfoliates dry skin cells. A superior blends of oils helps to nourish & moisturize the skin and Neroli flowers extract leaves an unforgettable scent. Directions for Use: Scrub, a spoonful onto body for hydrated, soft skin. Instructions: Do not put moist hands in jar. Store in cool-dry place away from sun. Buy Online: Purchase yours from HERE. Packaging: The first thing which I should criticize herein is a glass bottle. 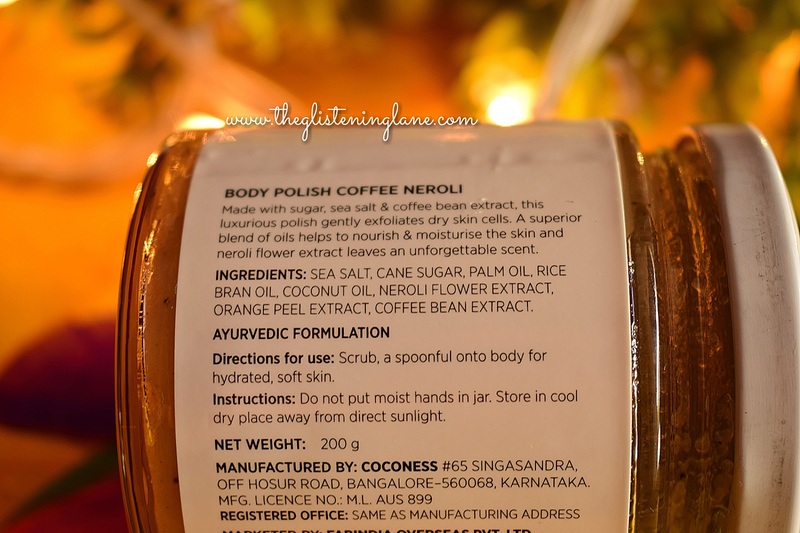 But somehow, being made of glass jar, the packaging spells LUXE to me! It has a tin lid and all the details imprinted upon the jar label. This jar can be reused once the content gets finished; I was thinking to store some of my jewellery pieces within this. The jar is definitely heavy, fragile and prone to breakage. Yet it is leak proof and you can travel with it by being extra cautious. People like me who bump into every other thing; warning given – no travelling with this! ▶Sea Salt: Sea Salt procured many minerals within it and is regarded beneficial for the skin. It helps in getting rid of tiredness of the skin. ▶Cane Sugar: Cane Sugar is known as raw sugar as well and it not only works to provide moisturization but also for exfoliating and removing the older skin cells. ▶Palm Oil: It works for moisturizing and helps within the sphere of anti-ageing. ▶Rice Bran Oil: It helps in improving upon your skin tone and provides hydration. ▶Coconut Oil: Coconut Oil helps in catering the skin’s hydration need and also lightens any kind of marks or pigmentation. ▶Neroli Flower Extract: Neroli works to provide natural fragrance as well as it helps in brightening the skin. ▶Orange Peel Extract: It helps in getting rid of black heads, dead skin cells, acne dark circle or dry skin, etc. 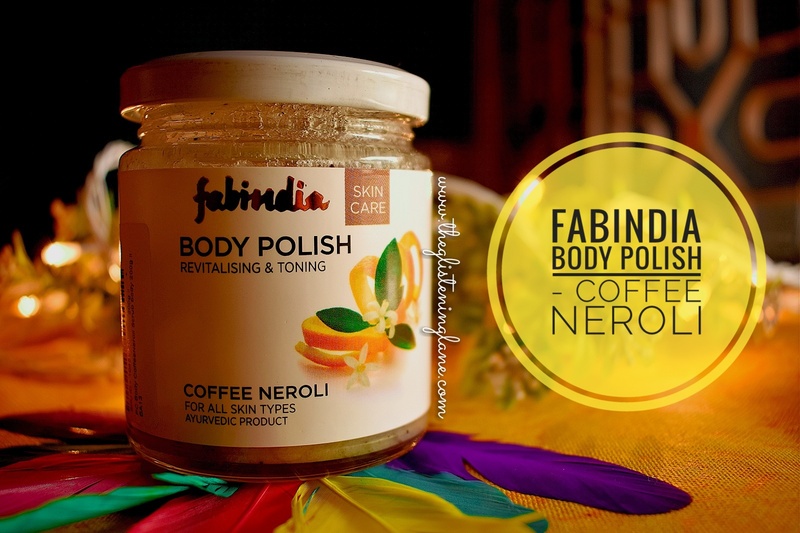 ▶Coffee Bean Extract: Coffee beans endows brightness to the skin along with working as an amazing exfoliator. 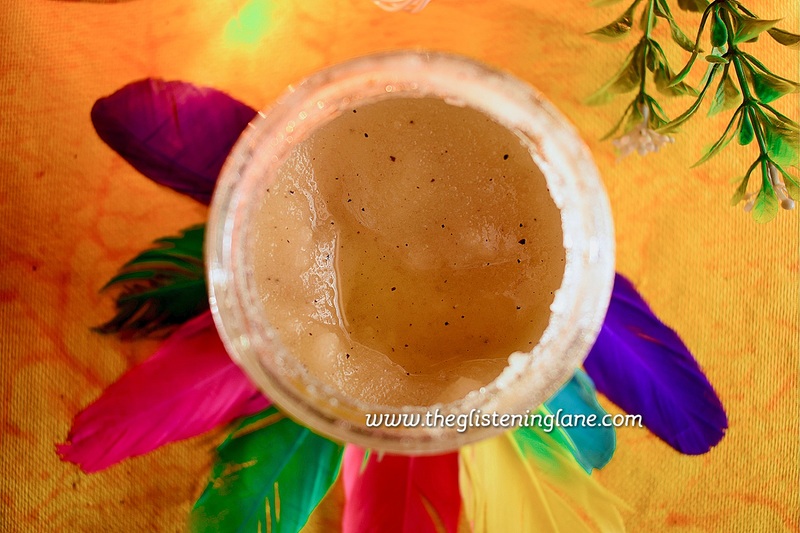 Have you ever been told that the maximum hydration can be attained via Ghee. Yes; during winters, if you undergo super flaky skin and no moisturizers work for you, then go grab a dollop of ghee. Now, some of you might say it smells terrible. Then probably, stock onto some coconut oil. So why is it that I’m talking of Indian Ghee here? 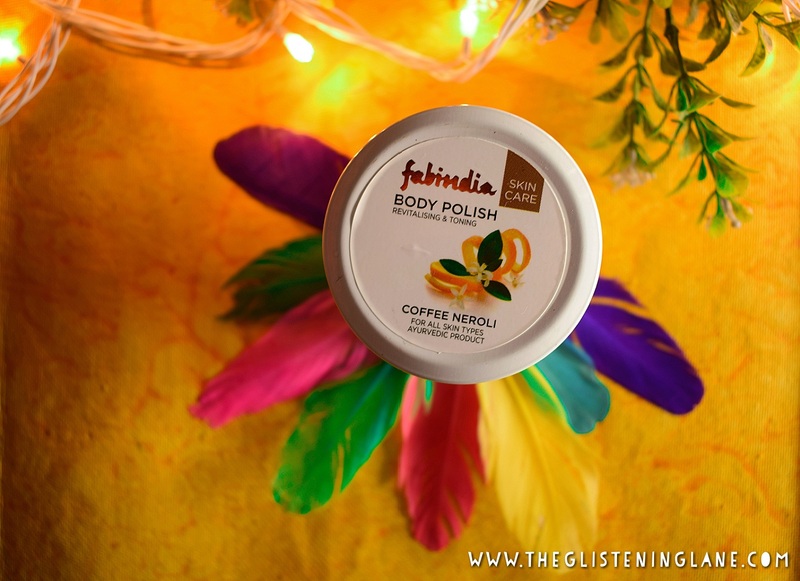 This Body Polish by FabIndia on appearance looks somewhat like ghee or coconut oil which solidifies due to cold weather. It has small brown granules of coffee and milled sea salt plus raw sugar. When I saw the ingredient list within store, I was quite impressed. It is devoid of any chemicals and every ingredient is purely edible. 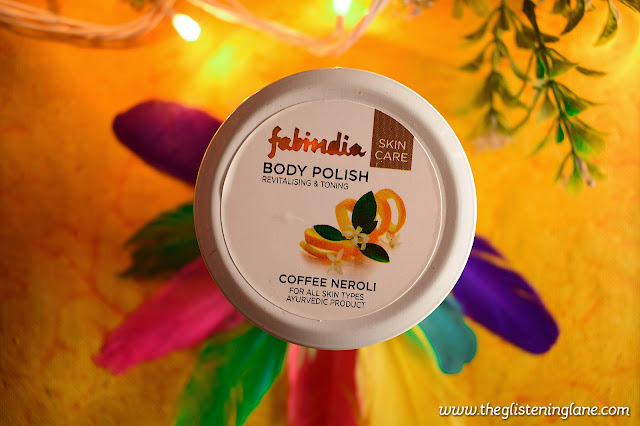 Now when I saw the tester of this at FabIndia store, I simply fell for its citrusy fragrance. You can quite evidently see oils being one of the constituents. Upon my bathing experience, I loved how it has fine cane sugar and sea salt into it. These grains help in exfoliation of the skin whereas the oils help in hydrating the skin. This is one of those products that work well for all skin type; especially for the super dry skin. Because of so many oils, you can literally skip upon any lotion and even after towel dried body; you’d see your skin being left smooth, soft and moisturized. The Neroli extracts help in brightening up the skin wherever it has been used. 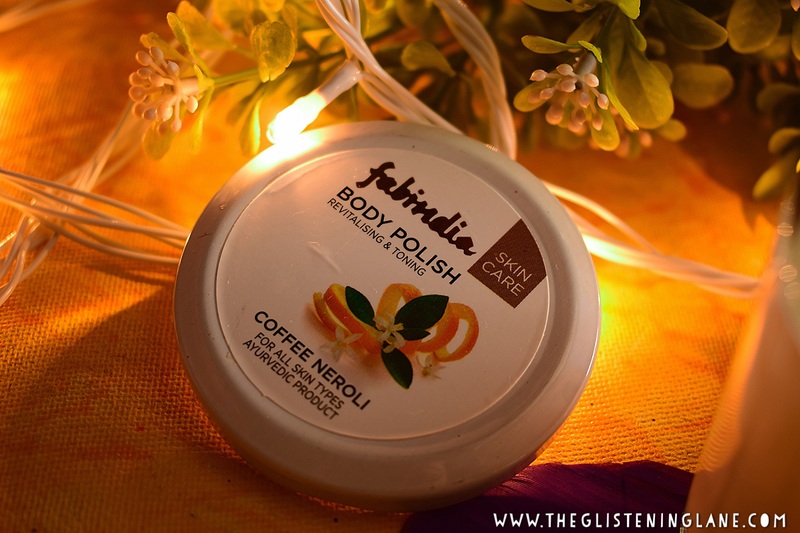 I haven’t ever used a body polish and I’m not sure how it ought to work but I believe this FabIndia body polish can definitely double up as your body exfoliator too. But make sure to scrub the gunk with gentle hands and not harshly. 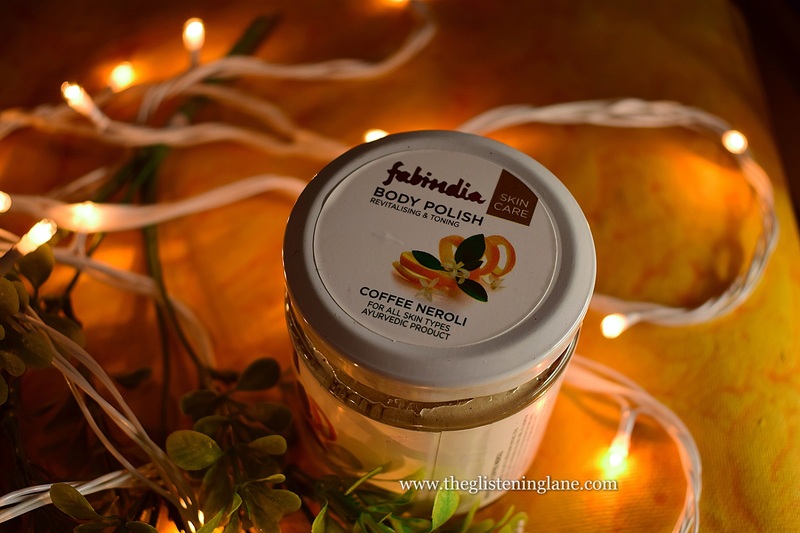 Herein, you might not be able to exactly get what the brand caters within their jar but of course using this DIY, the same purpose would be resolved, i.e. getting your skin exfoliated well. ⏩Take some sugar (the amount should be enough to work as exfoliating granules onto the desired part of body), add in coffee powder (milled or small chunks); to this pour some coconut or olive oil and mix everything roughly. ⏩Do not mix too much as it might lead to sugar being melted. ⏩Voila! 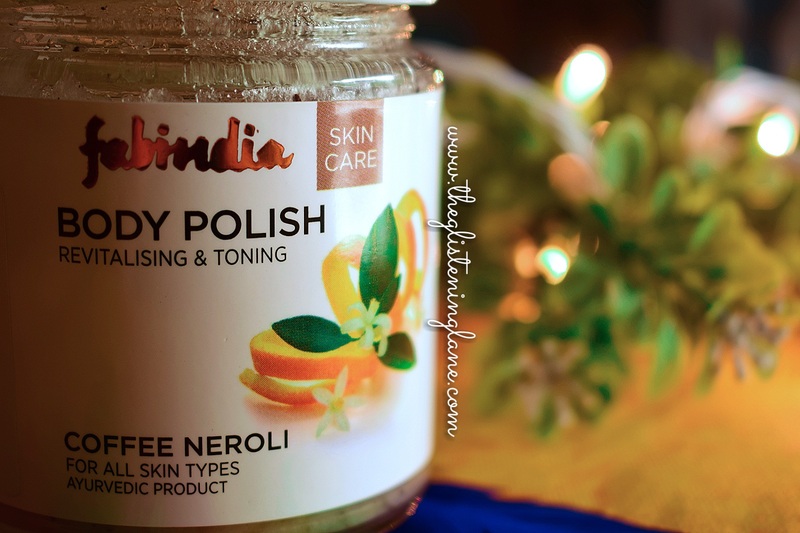 Use this concoction using hands for exfoliation. ❤You can skip upon body lotions after using this. Lovely review. I too get attracted to products with coffee. The texture looks amazing.. I have never used any fab india products.